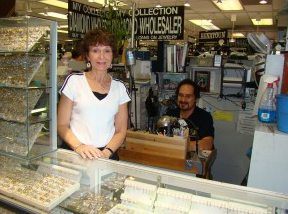 A jeweler you can trust as we've been here since the Exchange opened. We have a huge selection and the latest fashions of 14K gold and diamond jewelry such as bracelets, chains, rings, earrings, pendants, necklaces, and more. WE ALSO ARE THE EXCHANGES "CHARMS" HEADQUARTERS and sell children's and religious jewelry.